This incomplete plan shows the west range of King William's Court in an early stage of its evolution. It differs in a number of significant respects from the plan as executed, and from the design of the Dormitory in the wooden model, completed in January 1699 (Bold 2000, fig. 142). The applied portico on the west side is drawn as four half-square projections, implying four pilasters of equal size and projection. These come forward from the wall plane of the frontage on either side. In the fabric, the wall plane between the outer piers is recessed from the planes of the adjoining facades (see survey plan in Bold 2000, p. 141). The built arrangement seems to have been contrived to create space for steps up to the entrance within the portico, presumably because the boundary of the site (Friar's Road) was on the line of the west facade and no space was available for steps in front of the portico. The constraint imposed on this side of the site by Friar's Road as late as 1728 is illustrated by the site plan at [11/1] (SM 109/5). On the courtyard side the arrangement is closer to the built design, with deep outer bases for pairs of giant-order pilasters and shallow inner ones for smaller columns or pilasters. The main difference is in the provision of a stair up to the entrance with a central landing. The absence of any steps on the west side, and of a central door opening to correspond with that on the courtyard side, suggests that at this very early stage no opening was envisaged from Friar's Road. The drawing indicates that the principal entrance into the West Dormitory was initially conceived from the courtyard side. The staircases are orientated to be entered from the courtyard side, rather than from the road side. The draughtsman has even indicated a proposal to provide hearths in the vestibules of these staircases. The authorship of the drawing is far from certain. The neat ruled pencil and pen drawing could indicate Wren's hand, although this seems unlikely given the date. 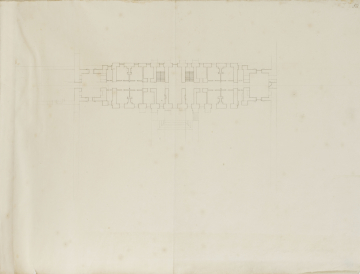 Had Hawksmoor drawn the plan, we would have expected a more accurate rendering of the end walls of the hall and south dormitory ranges and annotated dimensions. Sketched alterations to the plan suggest that the design is at an early stage, when the relationship of the West Dormitory to the Great Hall and South Dormitory had not yet been fully worked out. The draughtsman's initial intention was to link the hall and the South Dormitory via a central spine corridor, with the door in the south wall of the hall on axis with the corridor. This opening is marked in the penwork but is crossed out in pencil and replaced by a wall with a niche. The door is moved westwards and made narrower. A door into the South Dormitory is retained at the opposite end and still exists in the fabric.